"Scallopini" redirects here. For the squash, see Pattypan squash. Scaloppine (plural and diminutive of scaloppa - a small scallop, i.e., a thinly sliced cut of meat) (in English usage scaloppini; sometimes scallopini) is a type of Italian dish that comes in many forms. 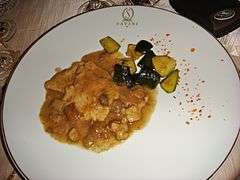 It consists of thinly sliced meat most often veal, pork, or chicken that is dredged in wheat flour, sautéed, then heated and served with a tomato-, wine redux-sauce; or piccata, which denotes a caper and lemon sauce. ↑ Annabella P. Hill (1995) . Mrs. Hill's Southern Practical Cookery and Receipt Book (facsimile Mrs. Hill's new cookbook,1872). Columbia, South Carolina, USA: University of South Carolina Press. p. 433. ISBN 1-57003-048-0. Retrieved 10 July 2012. ↑ Irma S. Rombauer, Marion Rombauer Becker and Ethan Becker (1997). Joy of Cooking. New York, New York, USA: Scribner. p. 684. ISBN 0-684-81870-1. Retrieved 10 July 2012.